Our house is the center of our world. We might not spend too much time in it but we like to return to our safe shelters, where we can enjoy a few valuable hours with our family and friends. We decorate our home according to our taste; we buy the most wonderful things and keep rearranging the furniture so that we will never get bored. We treasure our little nestles because we hide our whole worlds in there; we see our kids growing and enjoy looking at them playing with their friends in our front yard. After all, we strive to provide them the best we can and we do our best to secure them. We certainly cannot control their actions outdoors but within the limits of our own house we take the best possible measures to provide them safety and prevent any potential domestic accidents. Garage doors secure us from the outside world and provide us with the safety we need for our families. Yet, they need regular maintenance in order to operate properly and not cause us any unnecessary troubles. Our company can provide you with the best garage door repair services, which will maximize your door’s stability and durability. We have gained a great reputation in our community for our quality work and responsibility, for our professionalism and respect to you and your private premises. In fact, our company specializes on garage door openers since we consider them to be extremely important not only for your door’s excellent performance but also for your safety. Openers work in accordance with your garage door remote, which will enable you to control the operation of your garage door from within your car. We carry the best and most reliable openers from the largest manufacturers – Marantec, Genie, Liftmaster, Craftsman, Chamberlain and many others. They work with a drive motor, which is responsible for the opening and the closing of your door and they vary according to the price and the noise they make. For instance, the chain drive is very noisy but it is usually preferred because it is inexpensive. The screw drive will put your hand a little deeper in your pocket but it makes less noise and the last choice is the belt drive, which is really expensive but completely quiet. 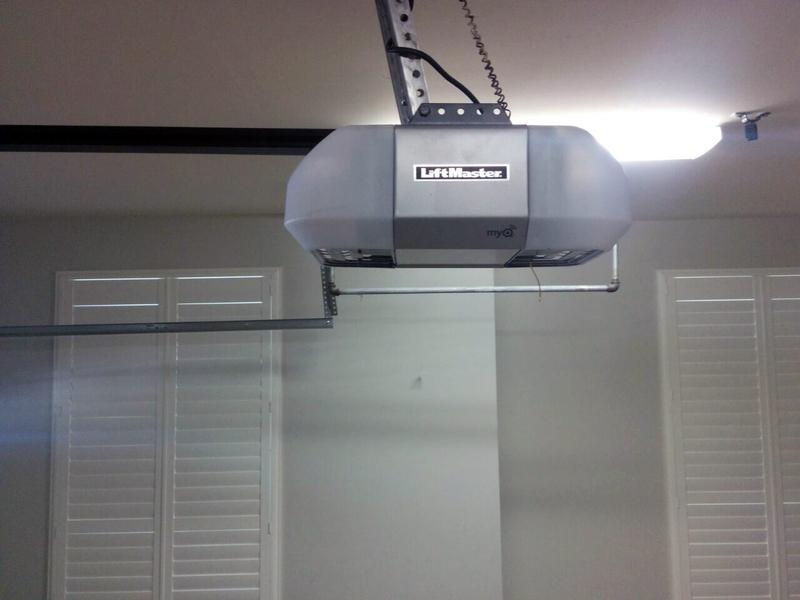 Our well trained technicians, who are experts in garage door opener repair, replacement and installation will explain you the differences and help you choose the right one for your door. They will install properly and thoroughly your new opener and in time they will engage in garage door opener troubleshooting service, which will help them identify any possible problems. Garage door remote services are very important if you want to keep your remote in a good condition. Our technicians will repair any possible damages if it’s broken or will suggest you a new one if it’s stolen or lost. Nowadays, there is a great variety of remotes in reasonable prices, which will fascinate you. Imagine that some of them can be installed in your car and when you approach them in the dark a light will be turned on to guide you. There are options depending on your lifestyle and needs by the best manufacturers and they will all provide you with absolute safety. You can choose the genie intellicode or the Liftmaster security + for their rolling code technology, which will change your code every time you press the button to open the door. Hence, the code cannot be traced by potential burglars. Moreover, you may choose the universal clicker or the multicode for various openers and frequencies accordingly. Our technicians have a long experience on garage door repairs and hence they will inspect the entire door to detect any possible damages. They have the expertise to replace your garage door springs, do a complete cables and tracks service, repair the emergency release or install a new garage door. They will make the proper adjustments and they will lubricate the moving parts. Remember that garage doors need an overall examination on a regular basis because you don’t want to face unpleasant surprises as being locked in or out of your garage. We will answer your call quickly and will ensure your safety.